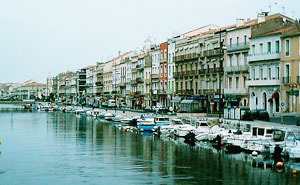 Historic Towns in the Languedoc-Roussillon: Sète in the Languedoc. 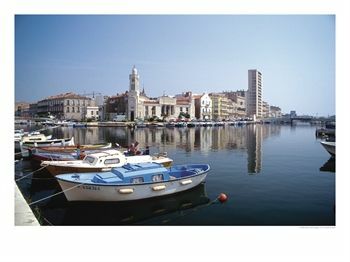 The former island of Sète was developed as a colony and a port by the ancient Greeks. At that time it was an island in the Mediterranean Sea, just off-shore. Today it is located on the mainland, in the Hérault département at the end of the Canal du Midi - to which the town owes its development since the seventeenth century. At that time it was known as Cette - the name you will find on old maps. 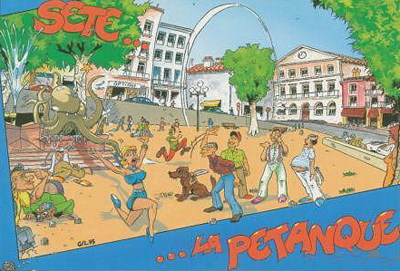 The spelling was changed to Sète in 1927.
the town lies to the south-east of the Bassin de Thau, an enclosed salt water lake (locally called an Étang) now used for farming oysters and mussels. Sète is one of the Languedoc towns famous for sea jousting tournaments (Joutes Nautiques). They are exactly what you might expect from the name, medieval style joustes but conducted from boats rather than horses. They take place from April to September each year. Sète lies on the Canal Rhône-Sète, an extension to the Canal du Midi, built by Pierre-Paul Riquet a notable Languedoc resident. The Canal is popular for boating holidays and through France's extensive canal network provides a way to get to the Languedoc from the Atlantic Ocean, Northern France and Mediterranean Sea. 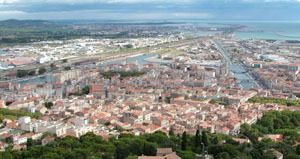 Sète was the home town of Paul Valéry (1871-1945), and Georges Brassens (1921-1981), both of them famous French poets. The town has museums to both. Brassens wrote a humourous and touching song about wanting to be buried on the beach as Sete "Supplique pour être enterré sur une plage de Sète" - arguably one of his best. Today Sete is an active port with freight and a passenger service to Tangier. Lying between the Etang de Thau and the sea, it is France's most important fishing port as well as a lively holiday resort with almost 8 miles of sandy beaches. 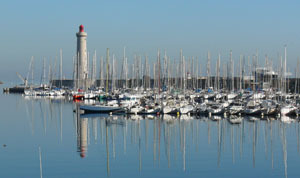 The Port de Sete Marina plays host to the America's Cup yachts. There is also a sailing school here. 'Meet Georges Brassens' in October.